Back in February, 2013 I went to a boy scout meeting where two other ham radio friends of mine did a demonstration of Morse Code for the young boys. I was bitten by the CW bug that night just like the black flies bite here in New Hampshire in the month of May. I started to do a little bit of practice in late February, but I kept getting distracted. In early March, Hanz Busch, W1JSB came over to my house and loaned me a nice portable Yaesu 817 radio that’s meant to take with you backpacking. It’s a very small and compact HF radio that puts out only 5 watts of power. But that was enough for us to transmit CW – continuous wave – to one another on 80 meters. CW is another name for Morse Code. If you hold down the key that transmits Morse Code, it will send out one continuous wave. When you lift up the key and stop the transmission, the wave stops. But if you hold down the key for different periods of time and in a certain order, you create Morse Code. A short transmission is called a di. A longer burst is a dah. So you send di’s and dah’s. Hanz and I started practicing even though I had not memorized all the letters. Hanz would send me a letter, and I would listen to it. We did that several nights and I learned my call sign. But I quickly discovered that if you want to get serious, you have to knuckle down and just memorize the alphabet, numbers one through ten and some basic punctuation symbols. By the beginning of April, I had all that down. I could send Morse Code, but I wasn’t totally smooth. It takes practice. I knew I was going to love CW, because on many a night I woke up in the middle of the night tapping out words on my pillow with my fingers. Crazy, isn’t it? Well, let me tell you – that’s a sign that you really want it. 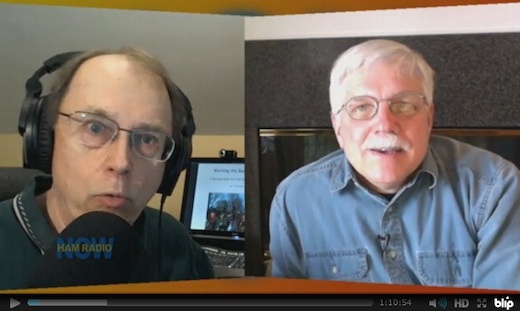 Right now my friend Jim Cluett, W1PID is helping me. He uses a cool program that allows him to type a message, set the words-per-minute rate, and it converts it into a cute little MP3 file. I download that file and decipher what Jim sent. I really appreciate his attention and his mentoring me. It’s really helping me. The hard part, for me, is listening and deciphering the code. I’m getting better, but it just takes practice. My goal is to be regularly transmitting and receiving by June 1, 2013. Did I hear that correctly on my Charlie 5 frequency? Stop the Boston Marathon? You can’t be serious? Yes, after 116 years of Mother Nature doing her best to stop this world-class running event, a terrorist attack was able to do in seconds what She couldn’t do in decades. I was a ham radio operator working the 117th Boston Marathon. It was the second year in a row for me. Fortunately for myself and my family, I was stationed eight miles away from the bombing attack. The radio communications team assigned me to work at First Aid Station 12 at the corner of Commonwealth and Chestnut Avenues near the center of Newton, Massachusetts at mile 18.3 of the race. This is my third season of working public service events using my ham radio skills. I have to tell you that I wasn’t expecting to become a thread in an historical tapestry, but I am now. I’ve got the photos to prove it, I’ve got one of the much-sought-after yellow and blue 2013 Boston Marathon volunteer wind breakers, and an abundance of personal memories to prove I was part of the tragic historic day. I’ve been told by many seasoned ham radio operators that the Boston Marathon is the premier public service amateur radio event. It’s the World Series. It’s the Super Bowl. It’s the World Cup. It’s the Daytona and Indianapolis 500 in one. I can tell you it’s as challenging a communications amateur radio event as you might ever work. Now that I’ve worked it two years, and that’s a very short time compared to many operators who have worked it for well over twenty years, the Boston Marathon deserves those accolades. Pre-marathon meeting at 7:00 a.m.
To put this in perspective, I regularly work public service events on Mt. Washington in New Hampshire. It’s a harsh environment with significant radio propogation issues compounded by the concentrated number of commercial radio and television station towers at the summit. But even though running, bike and car races claw their way up the 7.2-mile sinuous mountain roadway, we typically will only have 15 – 20 ham operators on a single frequency. We have a backup frequency, but it’s rarely used. The weather forecast set the stage for an epic day. Sunshine, temperatures in the mid 50’s, light wind. I’m not a runner, but I can tell you I’d rather run in that than the record heat of the 2012 Boston Marathon. 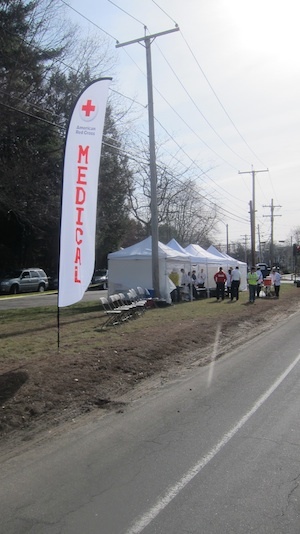 During the 2012 Boston Marathon our first aid station #12 at mile 18.3 tilted at least two times with runners in different stages of distress. I was told that I had the most ambulance calls of any other ham operator at last year’s event. Believe me, I was looking forward to a day with light traffic in our station. That’s just what we got as the race progressed. Most of the runners had minor leg cramps and blisters. We did have two runners that needed more extensive care. The radio traffic on our frequency was moderate to light. But just before 3:00 p.m., the rumors started to fly. Keep in mind that the frequency I was on was a mid-course frequency. My job is to just keep my first aid station supervisor, Mike Tryon, in the loop about what’s happening around us. Well, a terrorist or two or three made sure that soon enough there would be plenty of Need-to-Know information. The ground zero of the entire communications operation is an operations center called net control. A handful of ham radio operators are stationed at net control on radios tuned to specific frequencies. Each frequency covers a portion of the race course. Think of the race course as a line of linked sausages. Each sausage is a different frequency and net of its own. I was on C5 and the finish line was C7. Each individual amateur radio operator working at net control has a certain number of water and first-aid stations under his/her control. The net control operator for the mid-section part of the course I was working was Andrew Maroney, W2AJM. He’s an absolute pro net control operator. His messaging is concise, he’s prompt with replies, and he has a mind like a steel trap. Understand that his job is to just feed us information that’s critical to us fulfilling our jobs at our assigned locations. Even if he had access to widespread facts about what was happening at ground zero at the finish line, that would be nice-to-know information for those of use farther back from the finish line. Andrew only dispensed information and facts that the race organizers wanted us to know that was specific to our location and/or it was information to be broadcast to all ham operators. It’s part of the protocol. 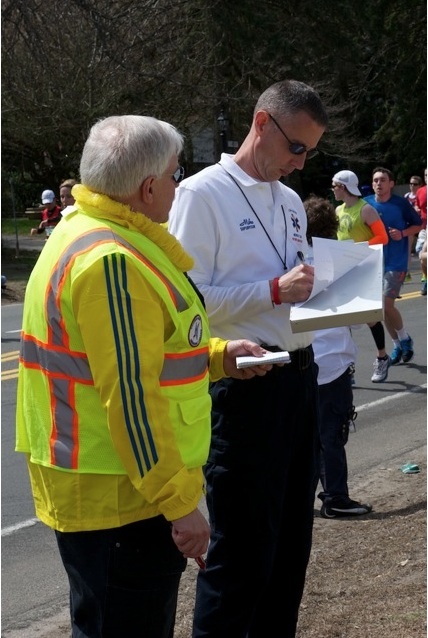 The race officials only invite qualified runners to participate in the Boston Marathon. This helps maintain the prestige of the event, but it also ensures that 99.9 percent of the people cross the finish line. At the finish line, the race organizers have all of the runners personal belongings, blankets, mylar heat-retention capes, water, an abundance of medical support, wheelchairs, etc. The first aid stations that are spread out on the course, like the one I was working, have many of these supplies, but in limited supply. After all, past marathon records indicate we maybe will see only 50 – 100 runners in our station during the race. But when the order was given to Stop All Runners, that decision created quite a few unintended consequences. We were very lucky at our station, because the vast majority of runners were farther down course. Just a handful of runners and walkers were approaching us after the bombs exploded in downtown Boston. How do the runners stay warm? How do the runners get fed? How do the runners get to their belongings? How do the runners discover if their loved ones waiting at the finish are okay? How do the runners let their loved ones know where they are? How will thousands of runners be transported to who-knows-where? But guess what, that’s where all of our training kicked into high gear. The spectulation is that government officials, within minutes of the explosion, shut off the cell towers in downtown Boston. I can’t confirm this. But it sounds like a good idea as bombers discovered years ago that cell phone towers can be hijacked to help them with their sinister and nefareous deeds. Cell phones are just radios. For years bombers have used cell phones as part of the mechanism to detonate bombs. It’s brilliant when you think about it. The bomber can be 100 feet away or a continent away, make a call to the phone connected to the bomb and BOOM. What really is happening? When you call a cell phone and it rings or vibrates, an electrical energy impulse within the phone happens that causes the phone to ring or vibrate. This electrical energy can be used to ignite a bomb fuse. It’s that simple. But don’t try this at home. Many runners don’t carry cell phones, and they were desperately trying to use anyone’s phone, including mine, to call their loved ones at the finish line. Everyone was getting a busy signal. That could have happened because the cell networks were overloaded, or because officials turned off the cell towers. The bottom line is there were several hundred people who were able to continue to communicate during the disaster. Police, fire and others like me who had radios were still talking. Keep that in mind. Perhaps this will be the wakeup call to convince you to get your amateur radio license and discover what hundreds of thousands of us already know. We know how to stay connected in disasters and other situations where traditional communications systems suddenly don’t work. Working at First Aid Station 12 with me was a gifted radio operator, Noah Goldstein, KB1VWZ. Another ham operator was also with us named Shirley Dulcey, KE1L. Mike Tyron, at our morning organizational meeting, requested that I stay at the First Aid station all day acting as his connection with the outside world. Noah and Shirley were assigned to the mobile medical teams. If runners need assistance at any part on the course between our station and the next closest first aid stations either up or down the course, a two-man medical team runs to their aid. A ham radio operator goes with them in case they need to request an ambulance or additional help. Noah is a young man, I guesstimate to be around 20 years old. He was bursting with energy and enthusiasm. It’s completely understandable because he’s participating in a world-class amateur radio event. As the anxiety ballooned after the blasts, Noah became restless. Not only was he concerned about a friend at the finish line, he wanted to also ratchet up his participation as a radio operator. Noah got his wish. Within 90 minutes, he was told to move down the course to First Aid Station 13 that was set up just west of the Newton, MA City Hall. Within a short time, the race organizers moved many of the runners to the city hall building. This got them out of the weather and into a covered building with plenty of chairs and real toilets. Buses were arriving bringing runners from other locations to the Newton City Hall. Noah was stationed at the City Hall building and was finally released about 6:45 p.m. He did a magnificent job all day, and there’s no doubt it will be a day he never forgets. Each radio operator in the field has enormous responsibilities. You could have a person’s life in your hands at any time. A runner may be in desperate need of help and the station supervisor may ask you to request an ambulance with advanced life support capabilities. What does this really mean? It means you MUST be able to communicate. This means you probably should come to the event with two radios. I had two radios. I could tune to two different frequencies. In fact, each of my Yaesu VX-7R radios is equipped to monitor two separate frequencies at the same time. I knew the frequency the finish line radio operators were using. I could have brought it up on either of my radios to gather nice-to-know information at any time. But I didn’t. It would be a distraction. I’m sure I wasn’t alone. My job was to keep Mike informed and listen to my net control operator in case he had a direct message for me, or an area-wide message for all operators. I’m sure that right now the leaders of the communications team are meeting, or have scheduled a meeting, to discuss what we did right and what we did wrong. Professionally it’s called an after-action report. I can tell you from my persepective that just about everything went right. Immediately after the bomb blasts, the radio traffic intensified. It continued to ratchet up as new challenges were exposed. But each time, the race organizers and communications team rose to meet the challenge. On my frequency, and I imagine that used for the finish line, there was never chaos. The reason was simple. 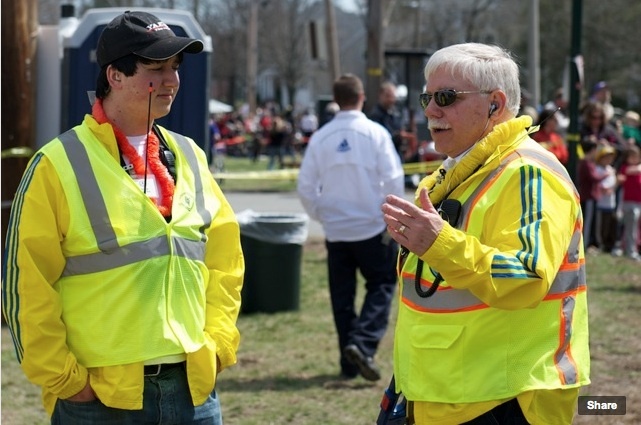 Amateur radio operators that volunteer for the Boston Marathon are anything but amateurs. That moniker just means we’re not paid to perform on the radio. It’s illegal for us to accept compensation if we use the amateur radio bands. I was in the company of nearly 150 professional radio operators that stayed focused, they didn’t clog the frequencies with unneeded requests, and they followed established protocols set up years in advance for just this dreaded situation. To be honest, it was a thing to behold. It’s my hope that all of the communications of the day were recorded for each frequency, and that they’re released one day so you can hear what I heard in my earpiece. I heard calm, focused and concise radio requests. I heard virturally no frustration. I didn’t hear any screaming. I didn’t hear any frantic requests for supplies. I’m still recovering mentally from the day. I’m very sad for those three innocent people who’s lives were snuffed out by the calous act of the cowards who set down the satchels containing the bombs. My guess is that at least two people were involved, with each person casually setting down the bag and seemingly forgetting to pick it up as he/she walked away. I’m also concerned about all those injured and the collateral damage caused to all those that know the dead and injured. I can tell you I’d go back tomorrow to work the Boston Marathon again. I’ll be even more vigilant. If you’re a ham radio operator, you should volunteer too. If you’re not an operator, consider becoming one. You can even volunteer to do other tasks non-radio related. I can tell you with confindence that many, if not all, of us will return. The terrorists will not take control of my destiny. No, it’s going to be the other way around. There will be a new awareness about being able to communicate when cell phones don’t work. I was lucky enough to be one who could communicate clearly, even with someone around the world, when tens of thousands of people couldn’t. I was lucky enough to be in a position to help many who needed help. That’s why all of us ham radio operators volunteered to be in Boston along with the thousands of other Boston Marathon volunteers. Believe me, we’ll be back. Hours after this post was published, I participated in a one-hour Skype interview with Gary Pearce, KN4AQ, the founder of HamRadioNow.TV. I urge you to watch this video to discover more about what happened at the Boston Marathon. You’ll also discover more facts about the operation.